The IMGA team proudly announces that Malaysia, the rising star of Asia, will welcome and host the first IMGA SEA this year in 2016. The event is open for all mobile games produced in SEA and the ceremony will be held in corporation with MDEC in Kuala Lumpur on 8th November, 2016. The first IMGA SEA is designed to discover the best mobile games in Southeast Asia countries including Brunei, Cambodia, East Timor, Indonesia, Laos, Malaysia, Myanmar, Philippines, Singapore, Thailand, Vietnam, and Taiwan. Both published and unpublished games are welcomed. The submission is 100% free and it only takes few minutes to enter your game. Follow us on Facebook and Twitter, we will keep developers updated with new status and answer the questions as soon as we can. The deadline for CFE is August 31. The submission page will be closed since then. But developers who have already submitted their games will still be able to edit their participation on our website. This year the IMGA invites 200 online jury members to accomplish the first round of online judging session in September, to select from all the entries a list of qualified games to compete in final 2 days Judging Session. The whole online judging session will last for one month. The Nominees Announcement will be released on October 4th in the IMGA SEA website as well as on our Facebook and Twitter. At the same time the People’s Choice Awards will be available for voting. We invites all nominees to spread the news on their social networks and ask their game players to vote for their favorite games. The winner of People’s Choice Awards will be announced during the ceremony. Around 15 jury members will be gathered in Penang, a beautiful city in Malaysia for two days, to play all pre-selected games and vote for winners for each category. The final list of winners will be decided during the judging session. 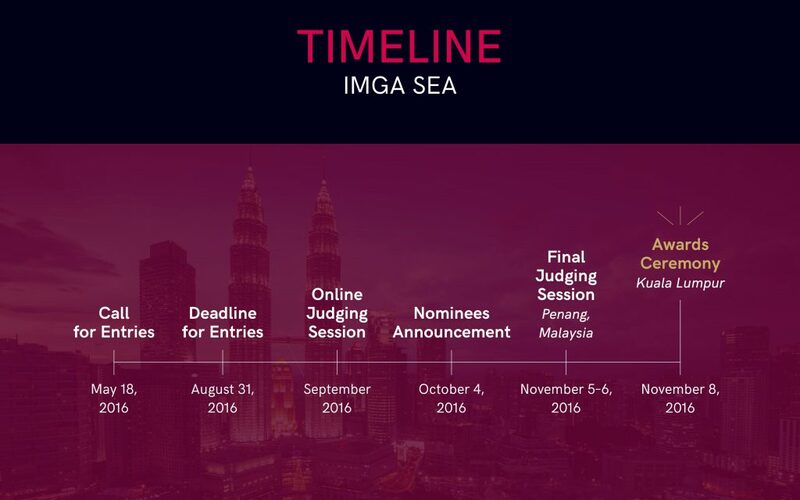 The 1st IMGA SEA awards ceremony will take place in Kuala Lumpur on November 8, 2016 in corporation with MDEC. All winners, nominees, IMGA partners, sponsors and journalists will be invited to the ceremony to celebrate the best mobile games of the year. After the ceremony there will be the IMGA party time. We are expecting comments, questions, partnerships, sponsorships and likes from you! Don’t hesitate to shoot us emails to contact@imgawards.com, we will get back to you very soon.